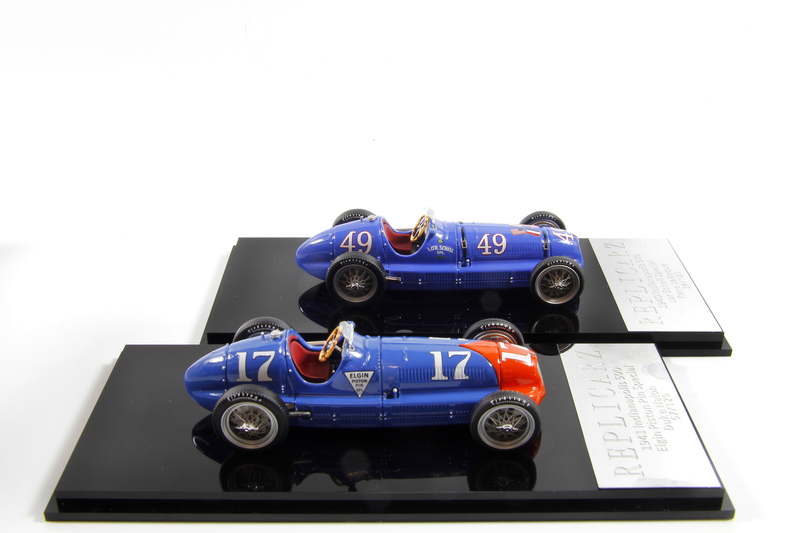 By 1940 there already were two other Maseratis in the big race, with more to follow in subsequent years. 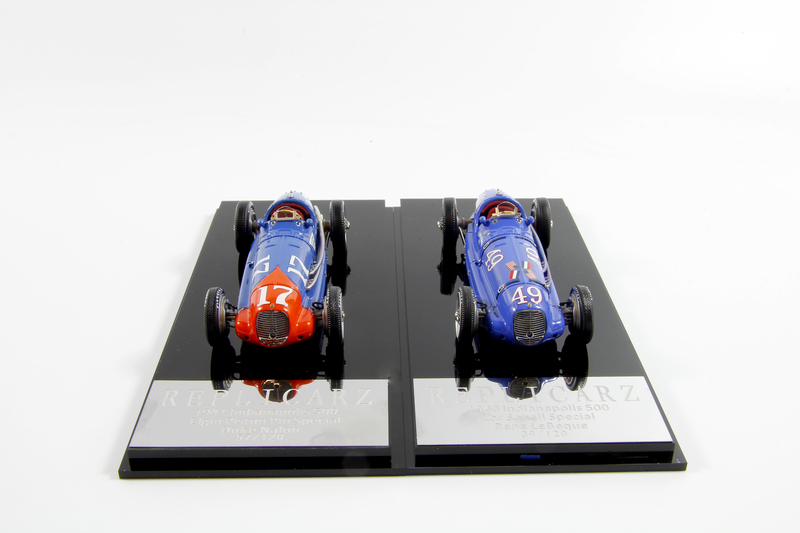 Replicarz, which earlier made the two Shaw winners, has created 1/43 versions of two Maseratis similar to Shaw’s. One is the ride of Frenchman Rene Le Begue, the other of Duke Nalon. Both are beautiful in their French blue paint schemes. In 1940 Le Begue drove from a 31st place start to 10th in his Maserati, sponsored by Lucy O’Reilly Schell, the first woman car owner at Indy. Le Begue completed 192 of the 200 laps and was running at the end. He won $1,488 for his efforts. As was more common at the time, he received relief driving help too, from another Frenchman, Rene Dreyfus. The following year Nalon, who would gain fame by driving the vaunted Novi in later years, took his Maserati from 30th starting spot to 15th. Nalon was still running at the end, but many laps behind, completing 173. His was the Elgin Piston Pin special. Mauri Rose drove a sister car to Nalon’s and sat it on the pole with a speed of 128.691 mph, so the cars obviously were still at the top of their game. But Rose had spark plug issues that put him out after 60 laps. The various Maserati racers that competed at Indianapolis had a long run. They returned after World War II with Ted Horn, a national driving champ, scoring a third place finish in 1946 again in the Boyle Maserati, the same Shaw had driven to two wins. Emil Andres was fourth in one of the Elgin Piston Pin Maserati racers that year, while other Maseratis finished 7th and 12th. Nalon was at the wheel of a Maserati again too, but finished 22nd. The Maserati racers last go-round at Indy was in 1951 when, now sporting an Offenhauser engine, one qualified 26th, but finished 32nd with a fuel tank issue putting it out after just 15 laps. Johnny McDowell was the driver. Like Replicarz’ earlier Shaw Maseratis, these are handsomely detailed with a photo-etched metal grille, tiny side mirrors, and spiffy wire wheels with spinner fasteners in their center. These both feature dual weathered chrome tailpipes along the car’s left side, whereas Shaw’s car had a single pipe. The blue Le Begue racer carries a white, trimmed in red, No. 49 on its nose, and both sides of its hood and tail. It also prominently features the U.S. and French flags crossed on the hood and the car’s name, the LO’R Schell Special just in front of the cockpit on either side. It varies from Nalon’s 1941 racer in another way with the inclusion of black hood straps and clasps. 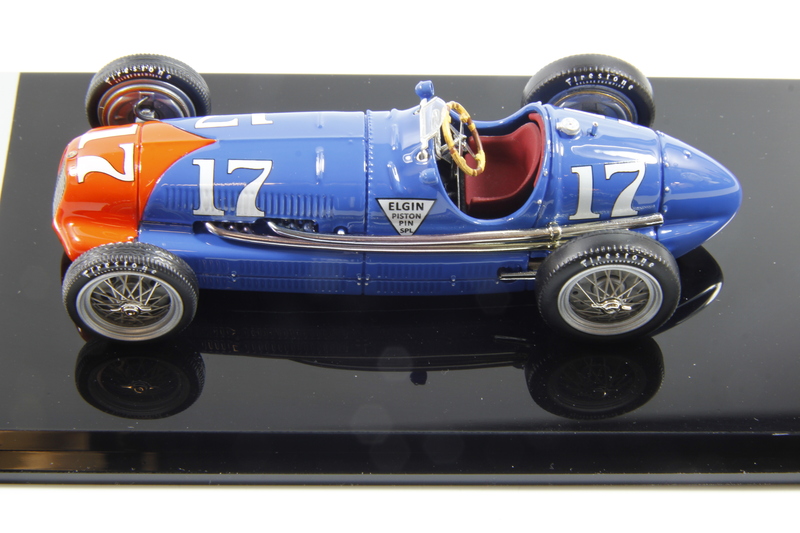 Replicarz’s version of the 1941 Maserati that Duke Nalon drove in the Indy 500. The Nalon car from 1941 has no such straps and clasps as the hood had more modern closures. The 1941 Maserati carries a white No. 17 in the same general locations as on the 1940 car. But the Nalon car is a bit more striking looking with a red nose in a modified flame style. The inverted triangle Elgin Piston Pin Special logo is affixed to each side too. Both cars feature the small thin flip-down windshields of the day, plus steering wheels that resemble the large wooden ones at the time that often were wrapped in canvass or leather for better grip and to protect the drivers’ hands. Shift levers, pedals and a dash with gauges complete the cockpit along with a red seat. 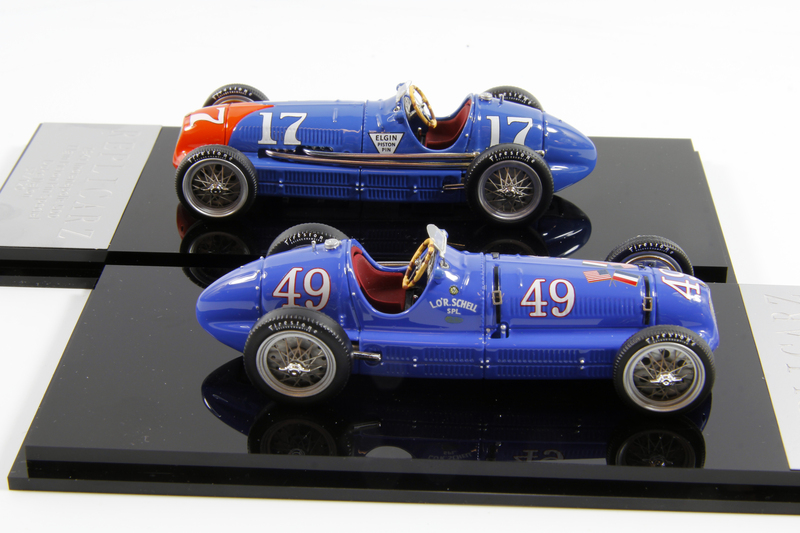 These are unusual but beautiful vintage Indy cars, and are a limited run of 120 each. Snap one up before they’re gone.